I’ll be honest, I’m pretty much intimidated by most French recipes, particularly those – like mayonnaise and hollandaise – that are delicate and require technical skill and a lot of whisking. Well, I decided to attempt to overcome this fear by attempting some homemade aioli (read: a sort of garlic mayonnaise sauce). All told, no one was injured (although my right arm got a really good workout from all the whisking!) 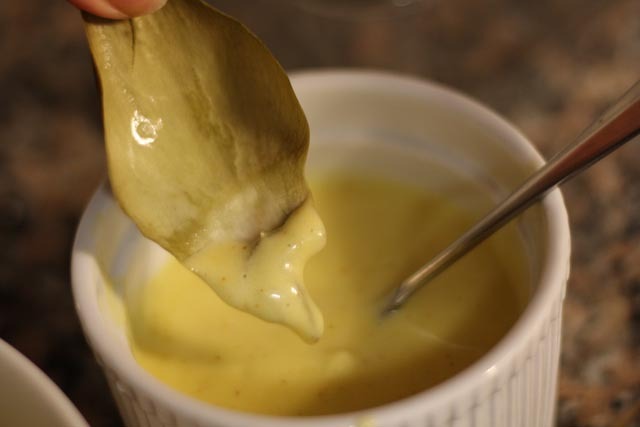 and my attempt was a success: a delicious aioli that paired oh so nicely with steamed artichokes. Yum! 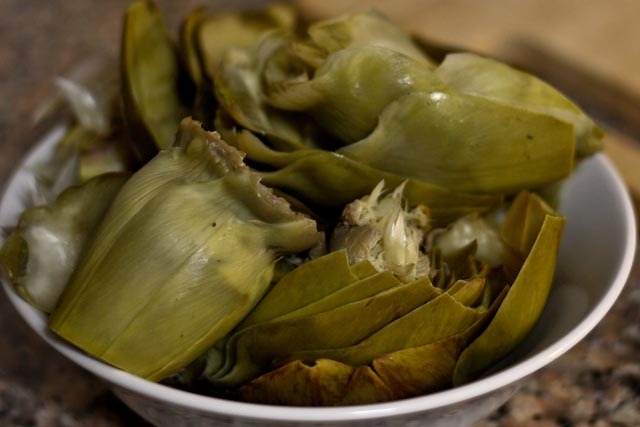 Steamed artichokes are very easy to make, and they’re delicious! You can easily steam them in water alone, or try a recipe similar to this one, which is based on a recipe by Tyler Florence. I cut off the tops of the artichokes. This helps keep them upright (bottom up) when steaming. 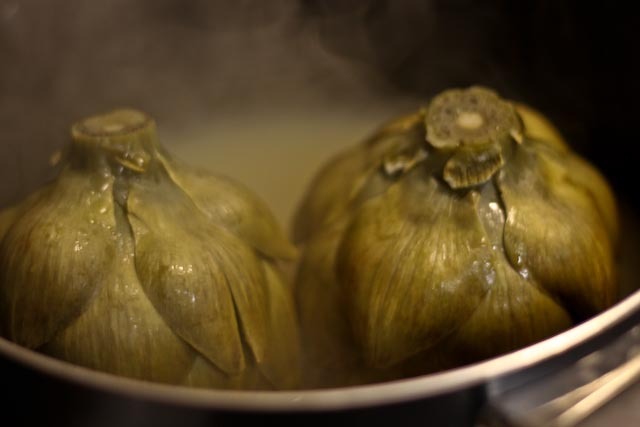 I think it also allows more of the flavors of the steam bath to be absorbed into the artichokes. 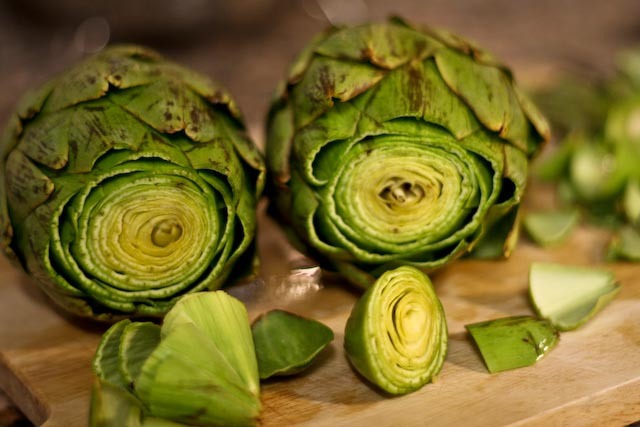 Like a little artichoke hot tub. Now for the aioli. Disclaimer: your arm will become very tired while whisking the emulsion of egg and oil. This emulsion takes time, as you have to add the oil a few drops at a time and constantly whisk the mixture to ensure the egg absorbs the oil and that the emulsion doesn’t break (i.e oil separates from the egg). One tip I learned from Bon Appetit is to fit your small mixing bowl into a small saucepan covered with a kitchen towel. This helps keep the bowl steady while you whisk away. 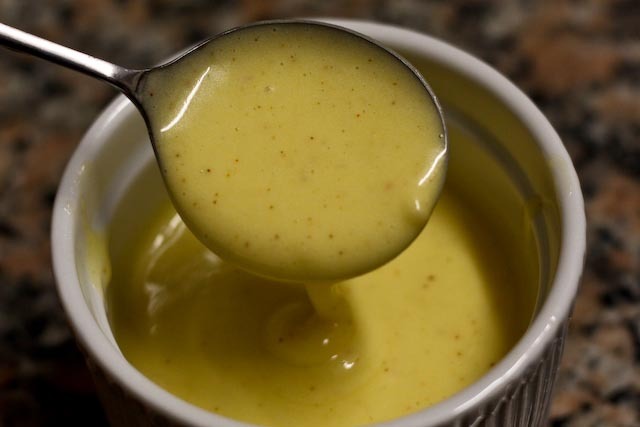 After whisking and whisking and whisking, the aioli looks something like this. A garlicky, tangy, creamy mayo-like dipping sauce that will beg for you to dip your artichoke leaves into it! We did. Every last bite – devoured. Especially the hearts – that’s the best part! Pinch the lower leaves off of the artichokes. 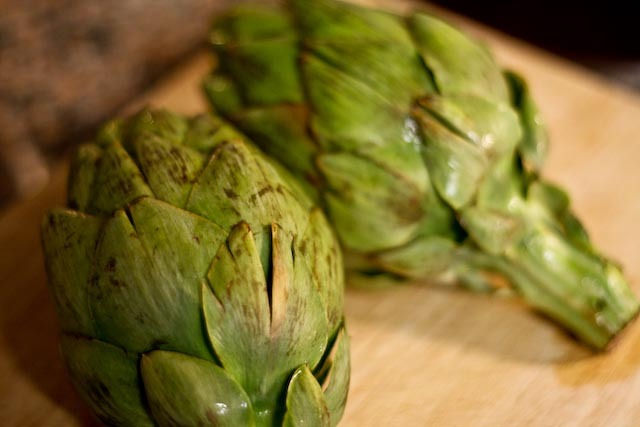 Cut the tops off the artichokes to help the flavors absorb better. In a large pot, combine the water, garlic, wine, lemon juice, olive oil, salt, pepper, bay leaves, and parsley. Bring the mixture to boil, then reduce heat to a simmer. Add artichokes, cut side down (bottom up), cover the pot, and simmer for about 30 minutes. Remove from steam bath and serve warm or room temperature with lemon juice, olive oil, or aioli. Drape a kitchen towel over a small saucepan and set a small metal bowl over it to hold the bowl in place. Whisk the egg yolks, garlic, 1/4 tsp salt and 2 tsp water in the bowl and blend well. 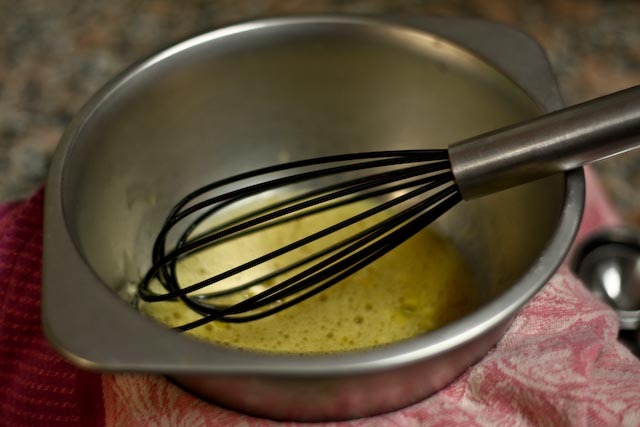 Whisking constantly, very slowly drizzle in the olive oil 1 tsp at a time, until the sauce is thickened and emulsified. Add a pinch of cayenne pepper, lemon juice, pepper, and additional salt to taste. *drool* yum yum yum!!! 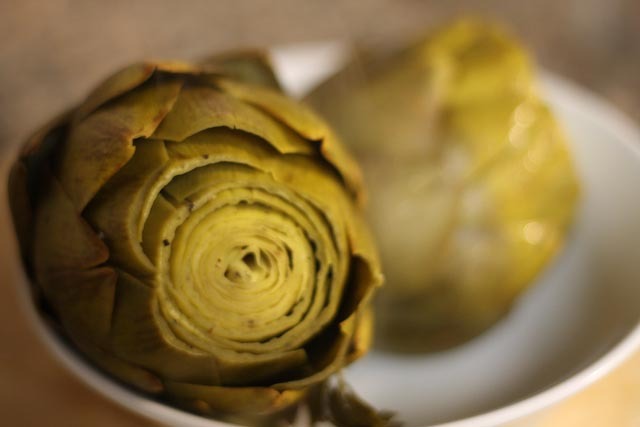 I love artichokes and anything garlicy!